They are finished! I finished the last one yesterday and got the labels on all three today. I sure hope my sisters like them. I have been very busy the past three months or so doing embroidery work on three quilt blocks that have been include in my sister’s quilts which will be their Christmas presents. It all started with a quilt top that my mother gave me that her mother had made. 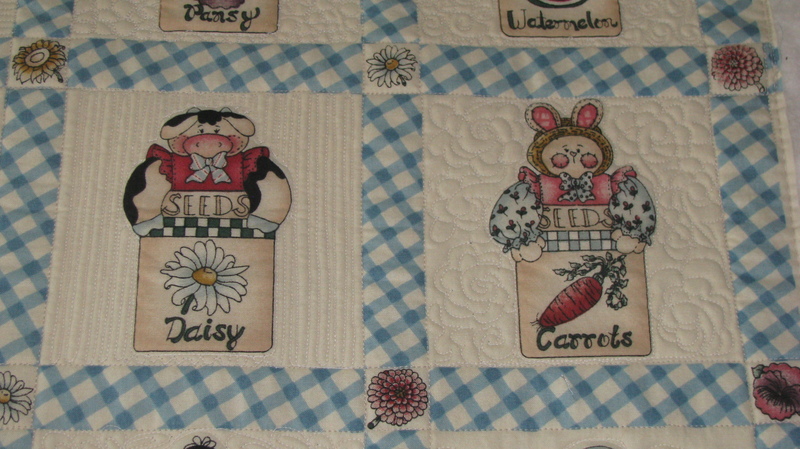 It was one of her first quilt tops – an appliqued Sunbonnet Sue which had 11 Sunbonnet Sues and 2 Overall Bills. I was at a total loss as to do with this quilt top until I saw a Sunbonnet Sue wall hanging that had 4 Sunbonnet Sues in it and 5 25-patch blocks. 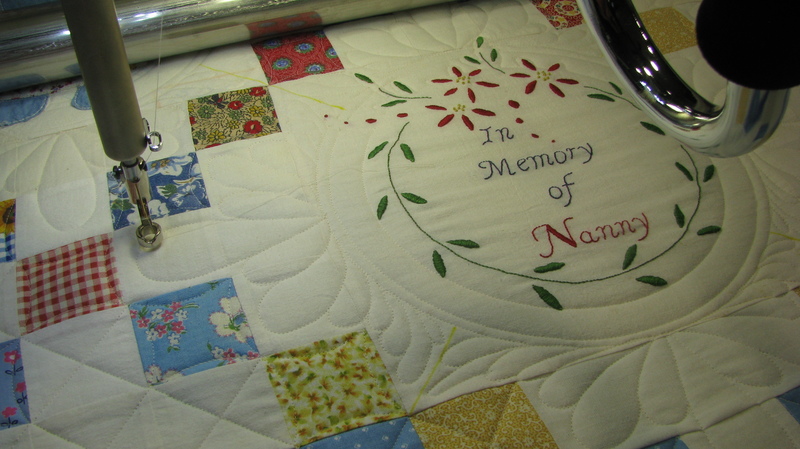 I decided right then and there to divide the quilt top so that my 3 sisters and I would each have a part of Nanny’s quilt top. It dawned on me very quickly being a math teacher that 13 is not evenly divisible by 4. And I wanted to use all of the blocks in these 4 smaller projects. And there was the problem of having the 2 Overall Bill’s. 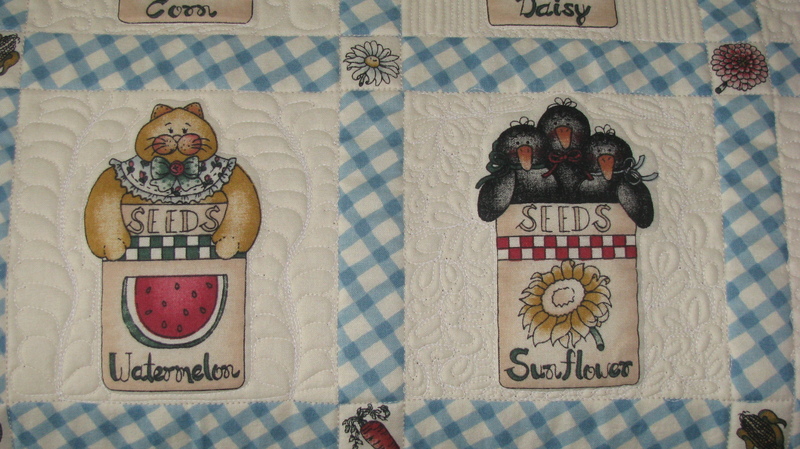 As luck would have it, the Overall Bill’s had matching Sunbonnet Sue’s, so those 4 blocks would go into one quilt. Now to divide the remaining 9 blocks into ones that looked good together. Now, as you may recall, I needed 4 Sunbonnet Sue blocks to make each of these wall hangings and I only have 3 for each of them. So what to do. I decided to make an embroidered block to fill in. It was all hand embroidery which I don’t really enjoy doing so had to force myself to work on them. But after about 3 months the embroidery was complete. Yay! 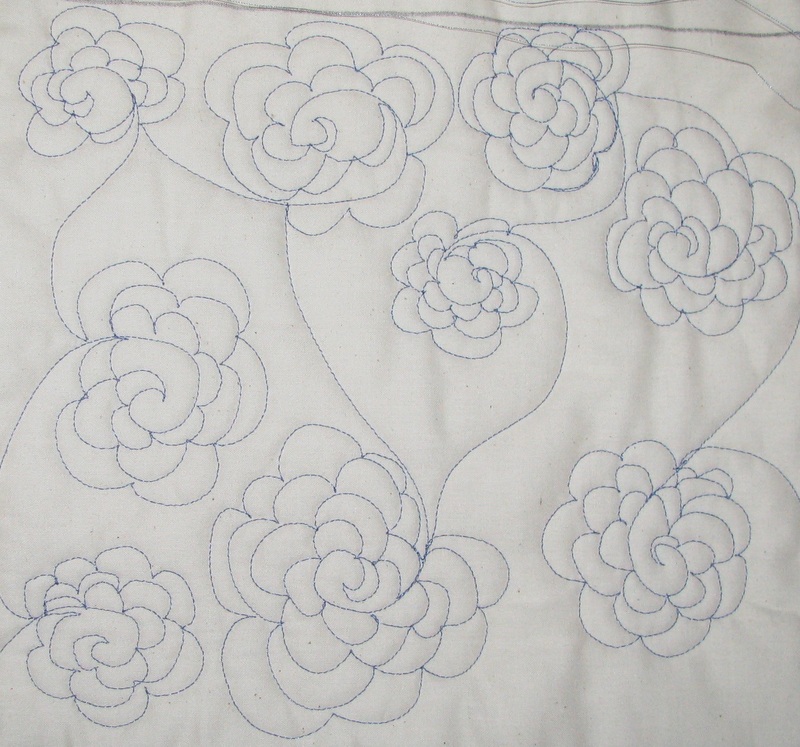 Now the real fun begins – quilting the quilt. 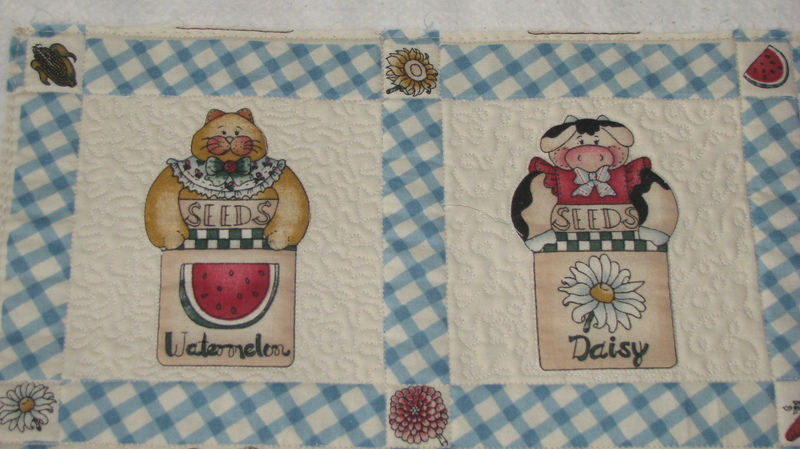 Most of the quilt is ruler work with a straight ruler for the cross hatching and various sizes of circle rulers. I felt somewhat like a contortionist quilting around those circles. The rest is FMQ. I have finished the quilting on 2 of them and am working on the hanging sleeves and binding. 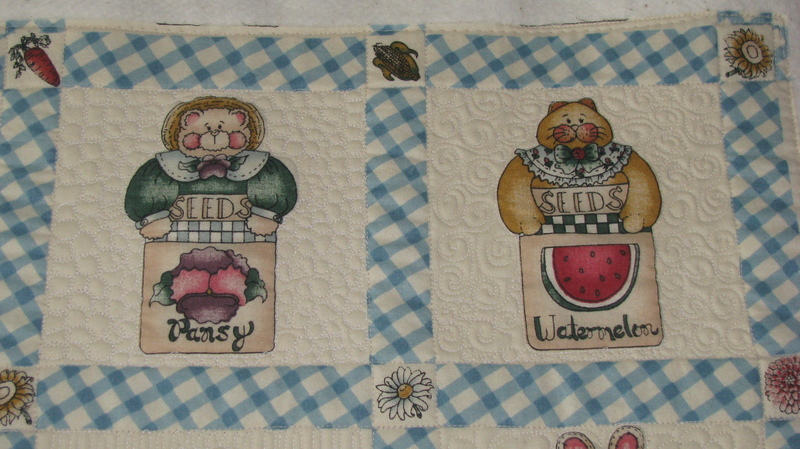 Here is a picture of one of the quilted embroidered blocks. I will do an update to this post when the 3 for my sister’s are completed. Mine has been put on hold until all the Christmas gifts are done. Since my blog passed the 1000 hits mark yesterday, I am celebrating by sharing with you how I made the 3-ruffle skirt for Nikki. 1. Measure around your doll at the widest point that the skirt will have to go over. My doll measured 11 1/2″ at the lower hip (her widest point). Add 1/2″ to this measurement for ease and 1/2″ for the 1/4″ seam allowances. My final measurement was 11 1/2″ + 1/2″ + 1/2″ = 12 1/2″. 2. Measure how long you wish the skirt to be. I wanted my doll’s skirt to be 5″. I wanted the top section to finish at 1″. Then I added 3/4″ for seam allowance and turn down at the top when the elastic is sewn on. So that measurement was 1″ + 3/4″ = 1 3/4″. Then I cut the top piece which measured 12 1/2″ x 1 3/4″. 3. Now I have 4″ left for the ruffles (the skirt length minus the finished length of the top piece; mine was 5″ – 1″ = 4″). Next divide that measurement by 3 to find determine the finished length of the remaining 3 sections (4″/3 = 1 1/3″). But how much is 1/3 of an inch? So I used 3/8″ since it is very close to 3/9″ which is equal to 1/3″. Now I need to add my 1/4″ seam allowance. My ruffles need to be 1 3/8″ + 1/4″ = 1 5/8″. But I don’t want to have a hem. So I multiplied the ruffle length by 2 so that I could fold them in half making a very nice finished edge. That means the ruffle piece will be 2 x 1 5/8″ = 3 1/4″. Okay, the hardest part is done. Way to go! 4. I decided that I wanted generous ruffles, so I needed to cut the ruffle 3 times the length of the top piece in step 1. My top piece was 12 1/2″; multiplying that times 3 gives a length of 37 1/2″. If you want less generous ruffles, you can multiply by 2 or 2 1/2. So I cut 3 ruffle pieces at 37 1/2″ x 3 1/4″. 5. Now for the lining pieces that we will attach 2 of the ruffles to before putting them on the skirt. In step 3 we determined that the ruffle pieces when folded would measure 1 5/8″. I didn’t want the lining pieces to show below each ruffle, so I subtracted 1/8″ from this measurement to arrive at 1 1/2″. The lining pieces are cut the same length as the top piece and a little less in width than the folded ruffle. Mine were cut at 12 1/2″ x 1 1/2″. Sew the short ends together with a 1/4″ seam allowance and press the seam open. Fold in half lengthwise with wrong sides together and press. Gather the double layer of fabric along the long raw edge. Sew the short raw edges with a 1/4″ seam allowance and finish the seam with your choice of finish. Press the seam to one side. Tip: To reduce bulk I pressed the seam of the top piece and one of the lining pieces (this one will be on the bottom) in the same direction and the other lining piece (this one will be in the middle) in the other direction. 8. Matching up the back seams and using a little less than a 1/4″ seam allowance, baste the top ruffle to the bottom of the top piece. Baste the middle ruffle to the bottom of the middle lining piece and the bottom ruffle to the bottom of the bottom lining piece in the same manner. 9. With right sides together and matching up the back seams, sew the top of the middle lining piece to the bottom of the top piece using a 1/4″ seam allowance. The ruffle will be sandwiched between them. Finish each seam as desired. Press the seam up and topstitch 1/8″ from the seam through all layers above the seam so that the seam will stay up when pulling the skirt on the doll. Repeat these steps for joining the top of the bottom lining piece to the bottom of the middle lining piece. Using 3/8″ elastic, wrap very snug around your doll’s waist. Tip: You want this very snug because elastic stretches when you sew on it. Cut the length that you decided on. Overlap the ends and sew with a zigzag stitch. Determine 4 points (the back center, the front center, each side) on the skirt that are equal distances apart. I did this by using the back seam as center back and folding. Do the same thing for the elastic. Matching these points, pin the elastic to the right side of the skirt a little less than 1/4″ from the top edge. Sew along the edge of the elastic that overlaps the skirt while stretching the elastic to fit. Fold the top of the skirt to the inside so that the elastic does not show from the outside. Stitch along the other edge of the elastic while stretching it to fit. You have a beautiful new skirt for your doll. If you have any questions, please feel free to leave a comment. I will gladly help as best I can. Hope you find some way to challenge yourself to do something that helps you stretch your abilities. I Took A FMQ Class!!! I spent my week in Centerview, Missouri, at Hunter Heirloom Quilting taking some classes. The first day, my hubby and I joined a few other people to learn how to maintain our Innova longarms. The class was taught by Joe Hunter. I already knew the first few items he covered but learned a lot after he got past those. Hope my hubby picked up on things I may have missed. That was the whole idea behind having him go with me. 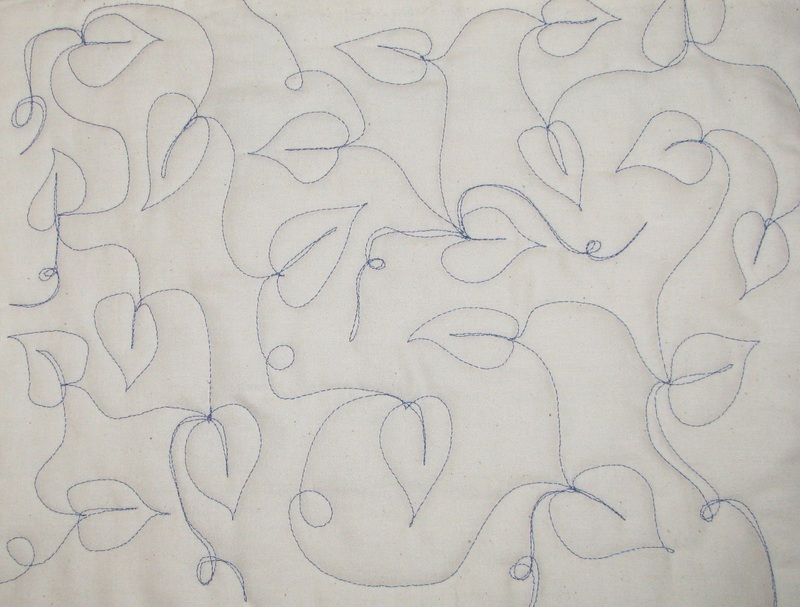 The next day I took my first ever quilting class entitled “Taming the FMQ Fear, Part 1”. 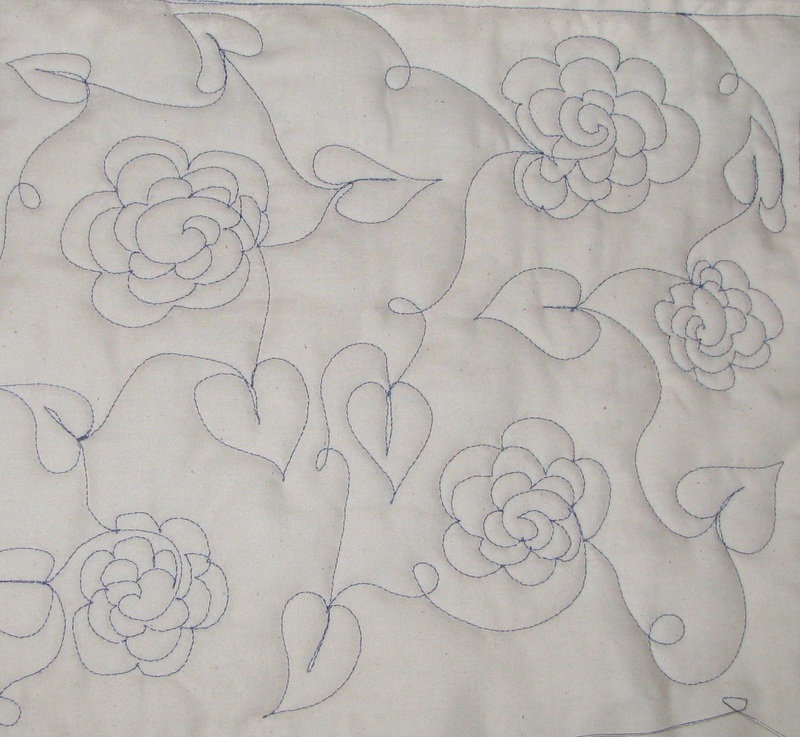 Since I got my longarm last May, I have done pantographs and ruler work mostly with a little free motion quilting (FMQ) thrown in. But the FMQ scared me because I was having trouble deciding where I needed to go next. Indecision can paralyze. I especially feared stippling. I still don’t care for stippling but found that there are alternatives that are much more fun to do. I not only overcame my fear, I began to improvise and create my own patterns. I especially like the rose pattern and one of the leaf patterns we learned. While doing the rose pattern, there was a little hip swinging motion going on. LOL It was a lot of fun. The last block that we quilted, we were encouraged to make up our own meandering pattern. I chose to mix the leaf pattern and the rose pattern. I was very pleased with the result and plan to use it on a future quilt. Hope you also had a good week doing something you love to do.